The cosmos was not formed from chaos... the cosmos is chaotic structure. The cosmos presents as diverse enforming processes within an existential environment of chaos. 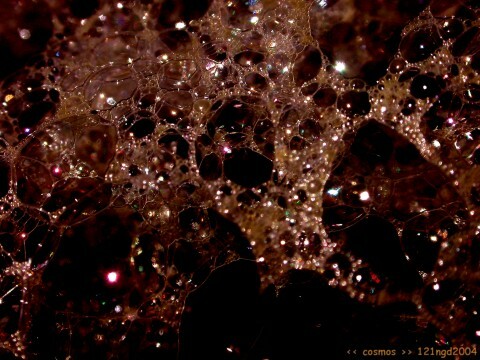 The chaotic structures of the cosmos are simplified by awarenesses into conceptual forms. The structure of the sun... for example... is contemplated by an awareness as a source of energy, a disc, a sphere, or a dynamic ball of thermo-nuclear reactions, depending upon the sophistication of the entity doing the simplification. There never was a time when the cosmos did not exist. It presents as a chaotic structure perceivable as interacting heterogeneous modes of energy. It is so complex in time, structure and inter-relatedness, that determining its absolute essence in conceptual form is an awareness impossibility. Awarenesses impose diverse forms of simplification upon the perceptions in order to manipulate parts of it and make advantageous predictions. The form of the cosmos is thus whatever abstracted pattern that a perceiving awareness ascribes to the structures within it. Structure within chaos is the condition that the cosmos presents as an awareness strives to conceptualize it. The forms perceived are simplifications of the cosmic structures. The abstracted and induced patterns observed... frequently modelled mathematically... can only ever be broadly descriptive of processes simplified, within an environment of ever-present chaotic perturbations. Whatever process or form is being observed or considered, an absolute description of that process... in terms of its circumstances and boundary conditions... is never realizable because the nature of the universe is that of macro-predictability within a micro-chaotic essence. The motion of mechanical entities, like pendulums and projectiles and spaceships, will always exist in a reality of capricious instability and consequently be subject to limits of predictive accuracy in any modelling attempts. The growth of organisms can be described in broadly general terms, but always exhibit variations because of probabilistic disturbances in their environment and biochemical pathways. All entities in the cosmos exist in a fragile bubble-like state of equilibrium and are annihilated by the first disturbance which exceeds their capacity to compensate. Substantial amounts of introspective energy have always been dissipated in conjuring up speculative hypotheses as to where the cosmos came from, why it exists, and when it began. Most conjectural religious-cosmologies promote the assumption that the perceived cosmos must have had a beginning. For there to have been a beginning of the cosmos, there would need to have been	a state when there was no cosmos. In effect, a timeless state of 'nothingness'. But it is impossible to sustain... even as a concept... the existence of 'nothingness'. It is entirely self-contradictory. Nothingness would have to be unequivocally an absence of being. It could not even be a potential for something. Not even an infinite vacuum energy field. Not even the presence of unpredictable gods or anthropomorphic deities with predilections for favoured ethnic groups. In fact, any awareness trying to contemplate the possibility of there having been nothingness at some former time, is immediately confronted with the situation that it is itself an existing thing trying to do some contemplating and howsoever it actually did come into being, it certainly can not have come from nothing. Any attempt by an awareness to suppose there to have been a primordial nothingness, is an attempt to deny one's own existence in the process of existing. The cosmos exists. It did not have a beginning. It will not have an end. Any human dissatisfaction with this state of affairs is comically irrelevant.